Why Isn’t This Enough? is for the woman who has everything she’s ever wanted: the nice husband, the healthy kids, the big home, even the career of her choosing. They have enough money, take family vacations and their kids are in a good school and thriving in their extra-curricular activities. From anyone else’s perspective, her life looks pretty enviable. Then why isn’t this enough? She married for safety and security. She married the good guy that wouldn’t hurt her. She plays the role of super-Mom because she can, and because she can’t seem to say “no,” to anyone but her husband. But after long days of caring for everyone else, connecting with her husband in any meaningful way feels like a chore and one more person that needs something from her. She has love for her husband and the father of her children, but she fears she’s fallen out of love with him. She chose this path, this marriage, this life, so why then does she feel so empty and alone? And if this isn’t enough, will it ever be enough? What would it take to feel happy and is that even possible? What kind of miracle is needed for this…all this….to feel good? Why Isn’t This Enough? 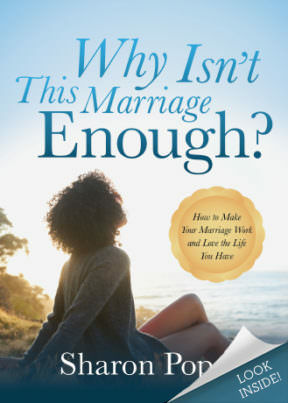 guides the reader through the answers to that important question and explores if the marriage can be transformed into a relationship that feels like more than enough. “Thank you Sharon for having the courage and being willing to share your personal story and others with those of us who feel broken, alone, lost and stuck.